Can your dog do all of these? 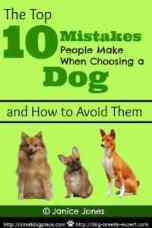 If not, don't despair, because this article will walk you through the steps so that your dog will master them in no time. I am not a professional trainer but I have trained many dogs over the years, taking numerous dog obedience classes with my dogs and read countless books on training. For a fact, I know these simple techniques work for most dogs. Puppies are easier, but older dogs can be taught new tricks. I chose one of my dogs to train for this article and photographed his progress along the way. I just wanted to be sure that even "old dogs can learn new tricks." 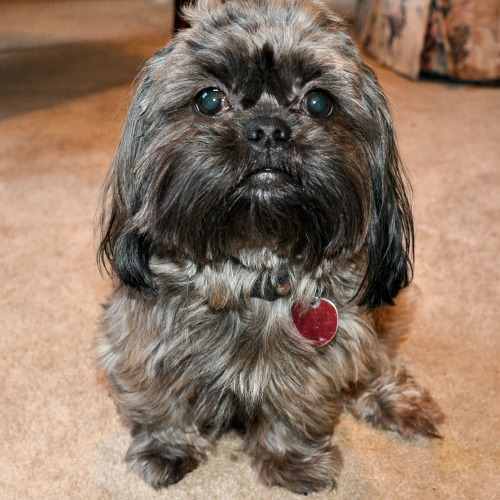 Meet Toby, my brindle Shih Tzu. He is going to help demonstrate these commands. These five simple commands can be accomplished using a clicker training tool and tasty treats or simply using your voice to “mark” the behavior. By “marking the behavior, I am referring to the particular behavior you want to see, whether it is to sit, stay, come, down or whatever. I use the word “yes” said in a relatively enthusiastic voice to mark the behavior. Others find the clicker to work equally well. Clicker-training using a metal clicker to make a sound that marks the behavior. Clicker training is a nickname given to a positive reinforcement training system based marker training. The psychology behind this approach is to teach the dog what you expect him to do first and then pair a verbal command such as sit or stay with his behavior. It is a positive approach that rewards behaviors that are desired or incremental steps towards the behavior you want. The click or a clicker or the word, “Yes” is meant to mark the behavior. The dog will begin to associate what he is doing with your click or verbal response and a food treat. Watch me or Look, Sit, Down, Stay, and Come in this article. All of these commands will take time and repeated practice. Do not expect to sit down with a new puppy and accomplish all of them in the first 10 minutes of training. Short training periods are best for very young puppies and then you can gradually increase the time you spend training. 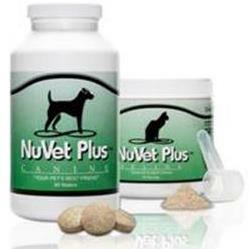 Start with a five-minute period and work up to 10 or even 15 minutes if you have your dog’s attention. Pick a time when your dog is rested, and you are relaxed. Try to keep distractions to a minimum at least at first. If you have a very distracted dog, keep the sessions short. Always stop before either of you gets frustrated or discouraged. The whole idea with positive training methods is that training is fun and upbeat. Find a treat that your dog loves and break it down into tiny, tiny pieces. You don’t want to spend all your training time waiting for your dog to eat the treat. A trick most dog trainers will tell you is a must is a way to hold your training treats. Unless you plan to walk around with training treats in your hand, a little container or pouch is a must. These training treat containers are necessary so your hands are free and treats are readily available when there is a teachable moment. There are a variety of pouches to choose from and the one you chose must be personalized to your needs. Here are a few dog treat pouches from which to choose. Basic Dog Commands: How to Teach Your Dog "Watch Me"
The "Watch Me" or "Look" command is meant to get and keep your dog's attention. You may keep your dog on a leash. If you are in your home, you may not need a leash. Outside? Use a leash. For this behavior, your goal is to get your dog’s attention in a positive manner. You want your dog to look at you. Take a tasty treat and hold it up towards your face. When the dog looks up at you, click and reward or say, “Yes” and reward. Do this several times until he understands that he gets a food reward when he looks at you. Reward when he does this. Repeat this several times until he is consistently looking at you. Next, say the word without showing the treat. Reward if your dog looks at you. Eventually, you’ll want to reward intermittently, meaning that at first, every “look” gets a food treat but gradually, not every look will be rewarded. It is best not to have a pattern such as every 3rd look when you are teaching this basic dog command. 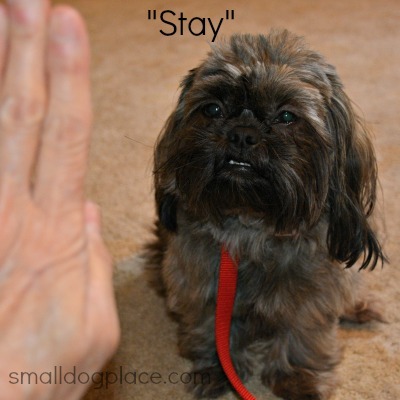 Basic Dog Commands: How to Teach Your Dog to "Sit"
Hold a treat at the end of your small dog's nose. Slowly move the treat up and over the head. When he sits, praise with a word such as Yes or click (if you are using the clicker method. Give the dog the treat. 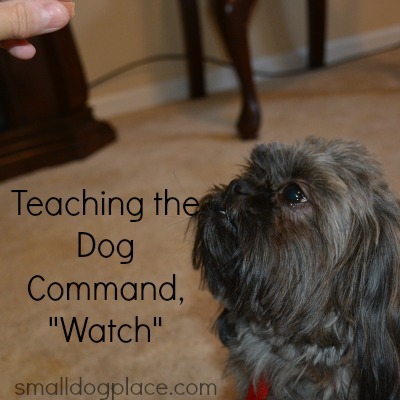 When teaching the "sit" command, if the dog jumps up, lower the treat. If your dog backs up without sitting, back him into a corner and wait for him to sit. When he sits, mark it with an enthusiastic “yes" or click your clicker and give the treat. Once he sits, say the word, "sit" to teach him the association with the word, the treat and his action. You will need to do this repeatedly over time until he consistently knows the word and the action. Once your dog sits easily on your cue, start to reinforce (treat, click and "yes" more intermittently. At first, every time the dog sits you will want to reinforce, but slowly skip one. Gradually, make your reinforcements even more random. 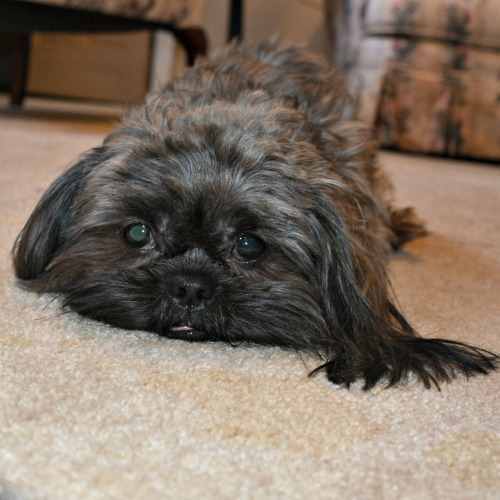 Basic Dog Commands: Teach Your Dog, "Down"
Once your little dog can sit, then it is time to teach him how to lie down. Put the dog in a sit position. Hold a treat in front of his nose and move slowly straight down towards the floor to where his front paws are resting. If he follows the treat all the way down, reward him with a click and treat or a “yes” and treat. If the Dog Doesn't Go "Down"
If he doesn’t make it down onto the floor, start again but move the treat more slowly. Click and treat for any downward movement such as his head is down or moving his paw forward. You may need to do these intermediate steps until he figures out how to get down completely on the ground. The technical term for rewarding these “baby steps” is called shaping or rewarding small parts of behavior until you see complete success. If you have no luck with this process, try it on a different floor surface such as a small mat, carpet, or hard floor surface – whatever you didn’t use in the beginning. Does your dog stand as you move the treat down towards the floor, put him back into a sitting position and begin to move the treat again towards the floor, only this time do it even more slowly? If he continues to stand up, you can say something like, “oops” which really means sorry, no treat for that. Click and reward or say “Yes” and reward for every small step he makes until final success. Sit on the floor with your knees raised. Have your little dog sit next to you. Hold the treat in one hand and place it under your knee to lure him under your leg. He may lie down to get under you knee and craw forward to get his treat. If he does so, click and reward or say “yes” and reward. Training is a slow process for some dogs. Do not get discouraged. If you find yourself getting impatient or if the dog loses interest, stop the activity. Begin again when everyone is refreshed. 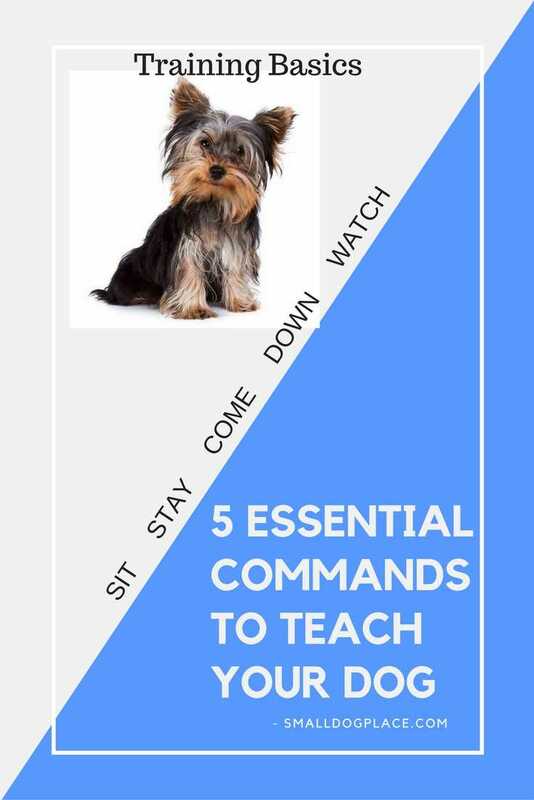 Basic Dog Commands: Teach Your Dog to "Stay"
Start in a sit or down position. Put the treat in front of the dog’s nose and keep it there. Click or say “yes” several times while he’s in position, then release him with a word you choose such as OK, done, free, etc. Pause, repeat the word, then click and reward. When you think, he is getting the idea, place the treat in your other hand behind your back. Say, “Stay,” then reward. Gradually repeat this step increasing the time that he should stay. When your dog can stay for 15 to 20 seconds, add a distraction such as moving your feet or arms, or shuffling your feet. Don’t add too much too soon. This is a harder command that requires our patience and your dog's concentration. After he can stay for 15 to 20 seconds with your distractions, start moving slowly away from him. Take a step back and then stop and return to him and reward. Always go back to him rather than calling him to you. The come command will be covered next, but it is not part of learning to stay. 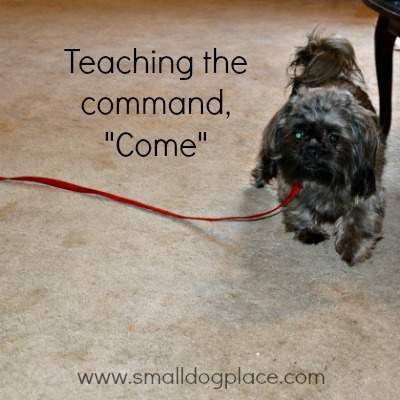 Basic Dog Commands: Teach Your Dog to "Come"
Also called a reliable recall, this command is more difficult to learn and may be even more tough for some breeds. It is also the most important command you can teach, and one that could save your dog's life one day. Your ultimate goal is to say the word, "come," and your dog immediately stops and comes to you without even thinking whether he’d like to do so or not. Caveat: Don't call your dog to you to punish, reprimand or do something that the dog finds unpleasant such as taking a pill or getting his ears cleaned. This is a challenging command and may take more time to master than the previous four behaviors. Start by assuring there is a small distance between you and your dog. Place a treat in your hands where he can see. Repeat with your dog on a loose leash. Step back a couple of feet and call your dog again. Mark and reward. Repeat, each time moving farther away. Gently tug on the leash as you call his name and say the word come. If he gets up or makes some motion in your direction, reward. Keep repeating this activity as long as your dog is interested, rewarding any "baby steps," or intermediate attempts to come. Once the Dog Understands "Come,"
Once you think the dog understands this behavior, play the “coming game” in your house. Reward if he comes to you. Go about your business and continue to ask the dog to come increasing the distance between you and the dog. Continue until you can call your dog to you successfully when you are in one room and your dog in another. Ready for the Outdoor "Come"
Do not practice this command outdoors in an open area until you are convinced the dog has a reliable recall. A long training lead (10-12 feet) should be used when practicing this outdoors for safety reasons. Continue to go through the same steps as above. As you practice this skill, add even longer leads such as a 20-foot lead to increase the distance between you and your dog. Some trainers recommend that you give your dog 3 treats every time he successfully comes when you call. The rationale between this is that it takes about the same time to give 3 treats as it does to get your dog’s leash back on or in the case of a small dog, to pick him up to safety if he gets loose and you must call him to safety. I think that is a good idea, but if you are going to do this, you must start training and rewarding with 3 treats each time. Otherwise, your dog may not hang around long enough to get the three treats and then dart out again. Once your dog is consistently performing these five basic dog commands, you will still want to practice periodically with and without treats. Now it’s time to move on to some more challenging tasks. Training should be an ongoing process throughout the dog’s life. It is a good way to bond and deepen the relationship over the years and a fun way for you to interact with your dog.